The name of Phaethon was a common one in Greek mythology, with a son of Eos, and indeed one of the Dawn goddess’ horses, both named such. The most famous Phaethon in Greek mythology though, was a son of Helios. The story of Helios and Phaethon was a widespread one, told many times by Ancient Greek and Roman writers, although arguably, today the most famous version of the Phaethon myth comes from Ovid’s Metamorphoses. The story of Phaethon, or Phaeton as he is also known, begins, in Greek mythology, when the character is a young man living in the court of King Merops of Aethiopia. Merops has adopted Phaethon, for Phaethon is the son of Merops’ wife, the Oceanid Clymene. Not being the true son of Merops is something that Phaethon is teased about, but in truth, there is nothing for Phaethon to be embarrassed about, for the true father of Phaethon is the Greek sun god Helios. Despite learning the truth about his parentage from his mother, Phaethon still seeks further affirmation, and so the young man sets out for Helios’ palace, where he finds the sun god. Helios swears on the River Styx that he will give anything that his son wants as proof of his parentage. It proved to be a rash promise, for swearing on the Styx formed an unbreakable promise, and when Phaethon asked for the unthinkable, Helios was left with no option but to agree. The unthinkable request of Phaethon was that the young man wished to drive Helios’ chariot across the sky for one day. Helios cannot break his word, but nevertheless, the sun god tries to talk Phaethon out of the endeavour, and Helios points out that driving the sun chariot is something that not even Zeus would consider doing. Despite the pleadings of Helios though, Phaethon is unmoved in his desire to drive the chariot. 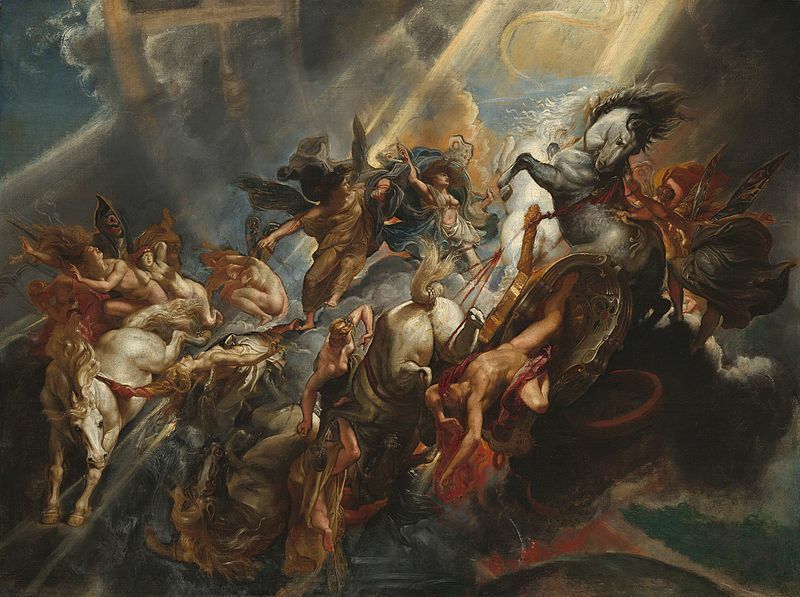 The four horses of Helios, Aethon, Eous, Phlegon and Pyrois, are then harnessed up, and with night dismissed, Phaethon sets of on Helios’ chariot. Almost immediately though, there are problems, for Phaethon cannot control the horses, and the chariot veers upwards and downwards violently. When the chariot of the sun god travels too high, the earth starts to freeze, but when it plunges downwards, the planet starts to burn. During one of these downward plunges, the chariot scorches the earth, and creates the Nubian Desert. A low trajectory also causes lakes and rivers to dry up. Zeus follows proceedings from Mount Olympus, and realises that the passage of Phaethon cannot be allowed to continue, and so the supreme god unleashes one of his lightning bolts. 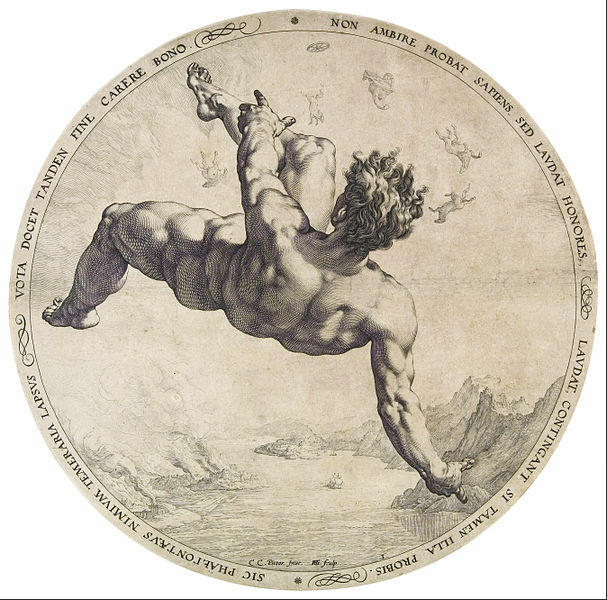 The bolt of lightning strikes Phaethon, and the lifeless body of the son of Helios plunges to earth, and falls into the Eriadanos River (a river often equated with the Po). 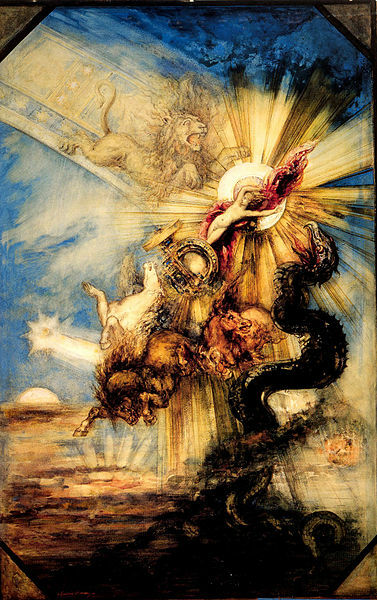 Helios was of course distraught at the death of his son, and for days afterwards, he refused to drive his chariot; and the earth was plunged into darkness for days, causing all to suffer. Zeus asked Helios to re-harness his horses, but of course Helios blamed Zeus for the death of Phaethon; although Zeus would claim it was the only way to save the earth. In the end, it required the pleadings of many other gods and goddesses of Mount Olympus, before Helios would once again drive his chariot. Helios was not the only one who mourned the passing of Phaethon, for the seven sisters of Phaethon, the Heliades, also grieved. The Heliades would go to the place where Phaethon had fallen, and for four months, they remained and grieved. The gods of Mount Olympus would see the grief of the sisters, and so the Heliades were turned into poplar trees, whilst their tears of grief were transformed into amber. It was near to this spot where the Argonauts would make camp during their quest for the Golden Fleece. Some ancient writers would proclaim that in memory of his son, Helios would have his likeness placed amongst the stars as the constellation Auriga. The constellation Auriga is the charioteer, and whilst connected to Phaethon, it is a constellation also connected with Erichthonius (an early king of Athens), Myrtilus (a son of Hermes), and Orsilochus (the inventor of charioteering).